Posing with a grand piano that will soon be refurbished thanks to a donation from the Rotary Club of the Abingtons are Abington Heights music faculty members, from left: Allison Kovell, chairperson of music department and orchestra director; Dana Cerminaro, choir director, and Rebecca Hetzel, band director. The worn keys of the grand piano at Abington Heights High School await repair. Discovering talent A collection of farmland animals in all shapes and sizes flocked to the Abington Community Library last month. A pig peered out at visitors in the Ryon Room and a duckling greeted readers at the end of the fiction aisle. Brush strokes gave texture to feathers and fluff, life to eyes, and colorful backgrounds to animals usually found in a barn yard. Abington Community Library’s March artist of the month, Dorothy O’Connor, didn’t describe herself as a painter until a little more than four years ago. She learned to paint at the Deb Hamby Studio in Dalton. “I come from an artistic family,” O’Connor said. “My mom quilts, my sister is creative and crafty, and Dad is artistic too. My brother Paul can paint and is a great photographer. Paul can do anything.” It seems the artistic gene wasn’t lost on O’Connor either. On March 28, the Abington Community Library hosted “An Evening with the Artist” event that featured O’Connor’s work. COMMUNITY CALENDAR UPCOMING APRIL 6 Abington Christian Academy’s “Sprinter” Rummage Sale: Welcoming spring and kicking winter to the curb. Saturday, April 6, 7 a.m. to 1 p.m. at the academy, which is housed in the Chinchilla United Methodist Church, 413 Layton Road, South Abington Township. Vendors are welcome as space is available. For more information, call ACA at 570586-5270 or send an email to fundraising4aca@gmail.com. APRIL 7 Finger Painting: Jazz of Herbie Hancock: Sunday, April 7, 4 p.m. at the First Presbyterian Church of Clarks Summit, 300 School St. Bill Carter and the Presbybop Sextet will perform. For more information, call 570-586-6306 or visit fpccs.org. APRIL 9 Soil - How to Make it Better: Tuesday, April 9, 6:30 p.m. at The Gathering Place, 304 S. State St., Clarks Summit. Penn State Master Gardeners will give info about easy, practical steps to make your soil better so your plants will be more flowerfun and fruitful. Cost: $5. For more information, visit gatheringplacecs.org. Mysteries and Detectives Book Club meeting: Tuesday, April 9, 7-8:30 p.m. at the Abington Community Library. The selection for April is John Grisham’s “The Ltiagators.” The May author is Harper Lee. APRIL 10 Everything You Wanted to Know about Marijuana But were Afraid to Ask: Wednesday, April 10, 7 p.m. at The Gathering Place, 304 S. State St., Clarks Summit. Joe Vinson will share the history of the marijuana plant, the botany and its effects on the body and brain. Learn statistics, laws and medical uses. Cost: $20. uburban SSuburban THE VOICE OF THE ABINGTONS A publication of TimesShamrock Community Newspaper Group 149 Penn Ave Scranton, PA 18503 Phone: 570-348-9185 Fax: 570-207-3448 suburbanweekly@ timesshamrock.com abingtonsuburban.com Managing Editor Elizabeth Baumeister 570-348-9185, ext. 3492 ebaumeister @timesshamrock.com Editor Christopher M. Cornell 570-348-9185, ext. 5414 ccornell@timesshamrock.com Advertising Manager Alice Manley 570-348-9100, ext. 9285 amanley @timesshamrock.com Advertising Account Executive Cali Nataloni 570-348-9100, ext. 5458 cnataloni @timesshamrock.com Photographer Emma Black eblack@timesshamrock.com 570-348-9100, ext. 5447 Staff Writer Clayton Over cover@timesshamrock.com 570-348-9100, ext. 5363 Contributors Joshua Arp Jennifer Familetti Teri Lyon Julie Jeffery Manwarren Linda Scott The Abington Suburban welcomes all photos and submissions. There is no charge for publication, but all photos and submissions run on a “space available” basis. The editor reserves the right to reject any or all submissions. Deadline for submissions is by noon the Friday before publication date. Opinions of independent columnists do not necessarily reflect those of the Abington Suburban staff. will give advice on how to pick one that suits you and your budget. Through all this, Gipson has met many people and become lifelong friends with other detectorists. As he says, “the best part of detecting is the people you meet. Stuff is stuff, but meeting and making friends is priceless.” For more information, visit GatheringPlaceCS.org or call 570-881-7612. Arctic regions. And they buy suntans to prove it. So as portrayed in Frances Hodgson Burnett’s 1911 “The Secret Garden,” the gardener occupies the lower strata of society. Yet, as Douglas Green writes, millennia ago, “Gardener” was one name for the king in Assyria. Further, “what appears to us as fairly unexciting activities—irrigation projects and the cultivation of a garden and a vineyard—were for the ancients clear evidence of royal greatness.” This spring, will you consider becoming rich by joining the gardener King outside? Joshua Arp is an ISA-certified municipal specialist, Clarks Summit’s municipal arborist and an operator of an organic lawn and landscape maintenance business. Reach him at josarhuap@aol.com. Waverly, v. Daniel J. Kazmierski, Waverly; married Aug. 12, 1989, in Lackawanna County; Paul A. Kelly Jr., attorney. ESTATES FILED ■ Paulette Maggiolo, also known as Paulette Blanche Maggiolo, 213 Elan Gardens, Clarks Summit, letters testamentary to Antoinette Blanche Jadus, 22 Siniawa Drive, Archbald. ■ Marion Harding, also known as Marion F. Harding, 1160 Old Trail Road, Clarks Summit, letters testamentary to Kimberly A. Dennebaum, same address. ■ Helen S. Powell, 100 Edella Road, South Abington Twp., letters testamentary to Carol S. Florey, 1186 Winola Road, Clarks Summit. ■ Florence T. Jamison, 1702 Falls Road, Newton Twp., letters testamentary to Lynne Jamison Bour, 393 Ledgehill Drive, Falls Twp. LAWSUIT ■ Patricia Heil, 118 Linair Farm Road, Dalton, v. Sarah Mosier and Anthony C. Donnora, 190 Fire Works Lane, Forkston Twp., seeking an amount not in excess of the mandatory arbitrational jurisdictional limits of the honorable court, on two counts, for injuries suffered in an automobile accident Aug. 31, 2017, at approximately 1:10 p.m., on State Street in Clarks Summit; Dave W. Rothenberg, attorney. FEDERAL TAX LIENS ■ Diane Brechtel, 1859 Newton Ransom Blvd., Clarks Summit; $20,437.19. ■ Mark and Barbara J. Slocum, 1627 Falls Road, Clarks Summit; $3,169.46. CABINETS RESTORED Cabinets Touched-Up, Restored, Painted. STEEL, Fiberglass & Composite DOORS Wood-Grained. Ceramic, Porcelain orcelain & Vinyl Tile Tile, Hardwood & Laminate Flooring, Regrouting & Custom Showers, Small Plumbing Repairs Owner & Installer 570-8 876-0 0705 Cell: 570-885-1510 PA #050244. How closely do you pay attention to your surroundings? Each week The Abington Suburban will test your skills of observation with a close-up or abstract photograph taken somewhere in the Abingtons. It may depict a scene from a local business, school, park, street corner or area landmark. Know this location? Submit your answer, along with your name and mailing address to suburbanweekly@timesshamrock.com for a chance to win a voucher for one dozen original glazed doughnuts, courtesy of Krispy Kreme in South Abington Township. No more than one entry per household will be accepted per week. A winner will be selected at random. an egg-ceptional Easter egg hunt. Games and crafts will be available. Cost is $15 per person. Tickets are available online at waverlycomm.org or by visiting The Comm’s office. No tickets will be available at the door. Sensory Friendly Easter Party: Saturday, April 13 from 3-5 p.m. at The Waverly Community House. The Comm will host this event for all children with special needs and their families. Highlights will include photos with the Easter Bunny, an egg hunt, crafts and games. Cost is $5 per person or $20 for families of four or more. All proceeds will benefit The Comm Interactive Center. Easter Egg Hunt: Saturday, April 20 at 1 p.m. at Countryside Community Church, 14011 Orchard Drive, Clarks Summit. For kids in sixth grade or younger. Register by emailing KenM14064@comcast.net with child’s full name, age and parent/guardian’s full name. Registration deadline is Wednesday, April 17. Last week’s photo was taken at Clarks Summit University. High School in 2010. While there, he played the snare drum in the marching band, was on the mock trial team and worked with the football team to edit and create highlight tapes for the players to send to colleges for recruitment. He is a 2014 graduate of West Chester University with a degree in communications. Other judges for the event are Stacy Lange from WNEP and Frankie Warren of Magic 93. The producer is Tony Nicosia and emcee is Evie Raflako McNulty. Rose Broderick spearheads the committee. Tickets for the event can be purchased for $15 in advance by calling 570-346-0759 or online at uncepa.org or $20 at the door. “The show is one that can be enjoyed by those of all ages,” said Fleming. “The talent is timeless and can be appreciated by all. Ages have ranged from 60 years old to 95-year-olds and you would be hard pressed to pick out the 95-year-old.” “I’d encourage people to come to the show,” said Sochovka. “It’s a really great family-friendly event and a great way to spend the afternoon. I’m looking forward to coming back home to NEPA for the event.” Funds raised at the event will support the programs of the four facilities the United Neighborhood Centers operates and the opportunity to offer new programs. An innovative program to help seniors live independently LIFE Geisinger is a unique and innovative program for older adults designed to give them the support they need to live independently. If you are an eligible older adult, the LIFE Geisinger Program can help you stay in your home while you take advantage of our comprehensive daily living and health services. We are here to care for you. Scranton: 570-558-6160 Wilkes-Barre: 570-808-8896 Kulpmont: 570-373-2100 For the hearing-impaired, call 570-271-8084. 587-4808. churchofstgreg@gmail.com. St. Patrick, 205 Main St. in Nicholson. Mass s ch e d u l e : S at u rd ay, 4 p.m. and Sunday, 11 a.m. E m a i l : s p o l a c h u rch @ gmail.com. spolachurch. weebly.com. Trinity Lutheran, 205 W. Grove St. in Clarks Summit. Sunday worship: 8:15 a.m. and 10:30 a.m.; Sunday School, 9:25 a.m. and Adult Education 9:30 a.m. Interim p a s t o r i s G e o r g e J. Mathews. office@TrinityLutheranCS. Church office: 570-587-1088. Preschool: 570-586-5590. TrinityLutheranCS.com. Waverly Community, 101 Carbondale Road. 10 a.m. Sundays: Badge of Honor, ages 2 to 12, to help children g row in their character, understanding of the Bible and relationship with Je s u s C h r i s t . 1 0 a . m . Sundays: Sunday school. 11 a.m. Sundays: wors h i p s e r v i c e , 7 p. m . We d n e s d ay s : H o u s e Church. Contact the church for the location. Pastor is the Rev. James Cohen. 570-587-2280. james@waverlycommunitychurch.org. Wave rl y U n i t e d Methodist, 105 Church St. in Waverly. Worship service Sunday at 9 a.m. Pastor is Rev. Michelle Whitlock. 570-586-8166; w ave rl y u m c @ g m a i l . com. 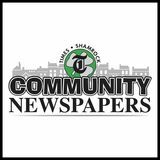 Send updates or additions about your Abington-area church to suburbanweekly@ timesshamrock.com. Red Pin Head Pin Strikees are Back. Throw a Strike and Win a Prize! Starting at 9:30 pm Every Friday & Saturday Night. ly” by Mark Harris ■ “The Southpaw” by Mark Harris ■ “The Celebrant” by Eric Rolfe Greenberg ■ “The Natural” by Bernard Malamud ■ “Hoopla” by Harry Stein ■ “Alibi Ike” by Ring Lardner ■ “A Day In The Bleachers” by Arnold Hano ■ “The Art of Fielding” by Chad Harbach Another sound that’s difficult to spell out with letters but easy to hear in your mind? The turning of a page in a book. On Wednesday, March 27, 2019, David Paul Wrobel, Clarks Summit, loving and selfless father of three children, passed away tragically at the age of 55. David was bor n on March 4, 1964, to Lois Sick Wrobel, and the late Frank A. Wrobel Jr. David was a 1982 graduate of Abington Heights High School, where he excelled in football and found some of his lifelong friends. David shared a strong bond with his loving family and community. His passions in life were being the best dad, love of family and God. He had a profound ability to care for and love others and always put them before himself. He regularly attended Parker Hill Church, where he displayed his love for God with his family. He instilled his strong faith in his children and demonstrated the way Jesus wanted us to live. David was loyal, motivating and would move mountains for those in need. He made an impact on every person he met and changed their lives for the better. He was known for his sense of humor and impressive ability to tease unmercifully with love and affection. David is survived by his three children, Casey, Courtney and David; siblings, Sandee Wrobel Phillips and husband, Jerry; Frank III and his wife, Stephanie; nieces, Silvia Phillips; and godchild, Leah Wrobel; nephew, Zyga Phillips. He was close to his many uncles, aunts and cousins and was loved by his friends who felt like family. David was also preceded in death by his nephews, Michael Straka Wrobel, and W. Adam Holley. David’s daughters would like to thank the first responders from Clarks Summit and Dalton who helped their dad and brother with care and understanding. They also have sincere gratitude to the countless people who reached out with food, prayers and monetary contributions. Funeral was Sunday at 4 p.m. at the Parker Hill Church, 607 N. Abington Road, Clarks Summit, PA 18411, with services by Pastor Paul McGuinness. Friends were invited to call on Saturday from 11 a.m. to 2 p.m. at the Lawrence E. Young Funeral Home and Cremation Services, 418 S. State St., Clarks Summit. APRIL 28 Abington Area CROP Hunger Walk: Sunday, April 28. Sign in time is 1:30 p.m. and walk time is 2 p.m. The 3.5-mile walk will start and finish at the Dalton Fire Company, 109 S. Turnpike Road. There is no fee to participate, but each walker is encouraged to raise $100 or more. A portion of the funds raised will support the work of local food programs and the remaining money will go to Church World Service to alleviate hunger in poor communities throughout the world. For more information, visit crophungerwalk. org/clarkssummitpa. watch the talented artists create unique artwork and consider purchasing your own piece. Choose from colorful glass flowers, hearts, chicks, eggs and more. Prices range from $10-$50, with some specialty items costing more. Music and arts fair: Saturday, April 13, 3-6 p.m. at the Theatre in Brooks. Keystone College will host its annual Music and Arts Fair. Open to the public and free of charge, the event features many artists and musicians from the college and local community. The main concert will be at 5 p.m. Argentina presentation: Monday, April 15, 6:30-7:30 p.m. Abington Community Library, 1200 W. Grove St., Clarks Summit. Join Keystone College Fulbright Language Teaching Assistant Mayra Agustina Munoz for “Let’s Talk Argentina.” A native of San Luis, Argentina, Mayra will share her Fulbright program experiences and offer insights on the differences between teaching in Argentina and the United States. Guests will also learn about the culture of Argentina through a slide show. Admission is free. Poetry reading: Thursday, April 18, 7-9 p.m. in Evans Hall. Keystone College will host a free poetry reading by Michael Montlack. Montlack is author of the poetry book “Cool Limbo” (NYQ Books) and editor of the Lambda Finalist essay anthology “My Diva: 65 Gay Men on the Women Who Inspire Them” (University of Wisconsin Press). Blood drive: Tuesday, April 23, 10 a.m. to 3 p.m. American Red Cross Blood Drive, Hibbard Campus Center, Evans Hall. The Center for Civic Engagement will host the American Red Cross Blood Drive. Lecture: Thursday, April 25, 7-9 p.m. Lecture by Keystone College Alumnus Arthur Magida ’65, Evans Hall. Attend a lecture by author, journalist and Keystone College alumnus Arthur Magida, ’65. Relay for Life: Friday, April 26, 5 p.m. to midnight Relay for Life, Athletic Field and Track Complex. Gather with the community to remember loved ones lost, honor survivors of all cancers, and raise money to help the American Cancer Society have an impact on cancer. Enjoy music, games, activities, food, prizes and more. Donations and team sign-ups are handled through the Keystone College Relay for Life website, relayforlife.org/ keystonecollegepa. Open House: Saturday, April 27, 10 a.m. to 2 p.m. Spring Open House in the Hibbard Campus Center, third floor. Learn about academic programs and the admissions process, enjoy lunch and tour the campus. You can even stay for a hike on the nature trails. Registration begins at 9:30 a.m., and the event concludes by 2 p.m. For more information, call the Office of Admissions at 570-945-8111. Spring concert: Sunday, April 28, 7-8 p.m. The Symphonic Band/ Vocal Ensembles Spring Concert will be held in the Theatre in Brooks. Admission is free. nebulae and galaxies. Large groups such as school classes, scouts and community organizations interested in attending should contact Jo-Ann Kamichitis at 570-945-8402 or observatory@keystone. edu to schedule a session. For more information, visit keystone.edu/observatory. DALTON — It’s Spring Book and Bake Sale time at the Dalton Community Library. Come in on Saturday, April 27 to visit during our sale from 9 a.m. to 3 p.m. As always, everything is organized and set up conveniently for easy browsing. Patrons will be able to look through labeled sections without shuffling through messy boxes or tables. There are many books that were bought in a store, read once and brought in for our sale. They’re practically brand new. There are lots of popular and modern titles. Another specific kind of book available at this sale is those that are collector’s items dating from as far back as the 1900s. They have been checked and in good condition. If you’re a book collector, make time to check these out. There are shelves of fiction and nonfiction books, biographies, mysteries, audio books, magazines and DVDs. We have had many donations over the past six months, and all these items are available for low prices. The Book and Bake Sale is cash only, with most items ranging as low as 25 cents to $1. Money raised during the book and bake sale helps support the library and our programs. On this day, the bake sale is full of breads, brownies, cookies and treats that are a great way to satisfy anyone’s sweet craving. There will be donated items, too, from a few local vendors. Everyone is sure to see or smell something tempting on the baked goods table. Remember to mark your calendars and stop in. Patrons will not be disappointed with all that is offered and the smiling, friendly faces that will be here to greet everyone. Bring a friend. Kid’s Crew The after school group, Kid’s Crew, had a great time gathering during an educational computer coding program that started at the beginning of March. The kids learned a lot and enjoyed their time doing. Thank you to Miss Terry for her time teaching our group. We hope to do it again in the future. Any children in elementary school interested in attending Kid’s Crew are welcome. Send an email to JFamiletti@albright. org for information. times during March, too, while our friend, Miss Bonnie, did special teddy bear story times. They watched her act out “The Three Little Bears” using props, dolls and puppets. She did crafts and songs with the children, too. What a special time. Thank you, Miss Bonnie, for sharing your stories and time with our group. We hope everyone is enjoying spring and remembers to come visit for our Spring Book and Bake Sale. We look forward to seeing everyone at the Dalton Community Library. Notice of Nondiscriminatory Policy as to Students Summit Christian Academy admits students of any race, color, national and ethnic origin to all the rights, privileges, programs, and activities generally accorded or made available to students at the school. It does not discriminate on the basis of race, color, national and ethnic origin in administration of its educational policies, admissions policies, scholarship and loan programs, and athletic and other school-administered programs. For additional information, contact Summit Christian Academy, 660 Griffin Pond Road, South Abington Township, PA 18411. “It would be our honor to serve your family” We honor preneed funeral plans from any funeral home. March 21 marked the 90th anniversary of the Rotary Club of the Abingtons. A historical talk was presented by Warren Watkins, a 50-year member and past district governor. President Ryan Campbell shared a cake and Champagne with everyone at the meeting. The club meets on Thursdays at 12:10 p.m. at the Ramada, 820 Northern Blvd., South Abington Township. For more information about the club, its events and membership, visit abingtonrotary.org. Phil’s Screen Repair We make new screens and do all types of screen repairs, along with re-screening of porch enclosures. Artist Maryann Polanichka of Dalton, right, chats with Karen White of Factoryville. People gathered at the Dalton Fire Company for Plates and Palettes, an event to view and buy vendor’s artwork and enjoy coffee and desserts. more photos from this event can be viewed online and are available for purchase from our photo store at abingtonsuburban.com. Artist Maryann Williams of Dalton, left, and Brenda Antoine of La Plume. Ed Antoine of Benton Twp., left, and Jim Cours of West Abington Twp. From left, artists Christine Franck of South Abington Twp., Ann Ross of Nicholson and Diane Stizza of Nicholson. Artist Estelle Kelly of South Abington Twp., left, and Marlene Cours of West Abington Twp. Artist Judith Youshock of Elmhurst, left, and Dorothy Sedock of Throop. Make your next meeting sweeter! Bonnie Flynn of Dalton views the artwork on display at Plates and Palettes on Sunday, March 31 at the Dalton Fire Company. Enjoy wholesale pricing when you purchase 10 dozen or more! Edie Suydam of South Abington Twp. displays her artwork. More photos from this event can be viewed online and are available for purchase from our photo store at abingtonsuburban.com. OVER 200 STOVES & FIREPLACES ON DISPLAY EVERY DAY! No Purchase Necessary. Times Shamrock employees are not eligible to win. Complete the grid so every row, column and 3 by 3 box contains every digit from 1 to 9 inclusively. The University of Scranton’s Hannah Kowalski moves the ball during the Landmark Conference women’s basketball championship game against Elizabethtown College on Sunday, Feb. 24. Pocono’s Ricky Kryeski will compete Sunday in the High School Raw 105 kilogram class (232 pounds). LaCoe also earned outs t a n d i n g l i f t e r at t h e Abington Heights Bench and Deadlift Championship meet the weekend of March 23-24. The Abington Heights sophomore won the 123-pound weight class with a bench press of 195 pounds and a deadlift of 455 pounds for a total of 650. In addition to LaCoe, Abington Heights, which had 28 team points to finish third, and Klein won the girls 105-pound class with a bench press of 115 pounds and a deadlift of 190 pounds. Sarah Pineire had a bench press of 95 pounds and a deadlift of 240 to claim t h e t i t l e i n t h e g i rl s 132-pound class. 30 years ago: At Abington Heights’ Winter Sports Night, Becki Howard was recognized for her career achievements of 1,275 points, 1,027 rebounds, 156 assists and 146 steals. 20 years ago: Amber Jacobs scored 35 points for Abington Heights in a 76-52 win over Cumberland Valley in the second round of the PIAA Class 4A playoffs. 10 years ago: Stephen Nicolosi had seven kills for Abington Heights in a 3-0 win over Wyoming Area in boys volleyball. Banquet: Hunting Heritage banquet sponsored by the Lake Region Longbeards chapter of the National Wild Turkey Federation will be April 6 at 5 p.m. at Genetti Manor, Dickson City. Additional information: bit. ly/2TKI7Kc. ■ Northeast Pennsylvania Friends of NRA will hold its 27th annual banquet April 13 at 4:30 p.m. at Genetti Manor, Dickson City. Additional information: 570-5872662 or dbcmoz@epix.net. Golf: Blue Ridge Trail Ladies Tuesday Evening Golf League season will begin April 9. New players are welcome. The league plays Tuesdays, 4-5:30 p.m., through Aug. 27. Cost is $35 plus green fees. Additional information: Shari Miller, 570-760-3872, or Tony Barletta, 570-868-4653. ■ Emanon Senior Golf League will meet April 10 at 10 a.m. at the clubhouse. Plans for the opening on April 17 will be discussed. New members are welcome. Additional information: Phil Amico, 570-362-1562. Scholarship shoot: Factoryville Sportsmen’s Club will host the annual Fred Loch Memorial Scholarship Shoot May 5 at 9 a.m. at its sporting clays course on Lake Winola Road. Shoot funds scholarships at Lackawanna Trail and Tunkhannock. Additional information: Carl Tylutki, 570-945-3137, Fred Rose, 570-903-5755, or fscweb.org. Softball: Applications are being accepted for the 2019 Sunday men’s Leighton softball league. Games will be played Sunday mornings and afternoons beginning April 14. Deadline to register is April 7. To register: John Leighton, 570-430-8437. Trout program: Trout have returned to the Lackawanna River now that acid-mine drainage has lessened, and guide Adam Nidoh will present a slide show where to found them during a meeting of the Western Pocono Chapter of Trout Unlimited on April 16 at 7 p.m. at the Nescopeck State Park. BOWLING SCORES The Alley Cats Bowling League scores from March 19 and 26 are as follows. Team Standings as of March 26: Wildcats - 69, Lynx - 63.5, Manx - 62.5, Tigers - 56, Bobcats - 56, Calicos - 52.5, Siamese - 50.5 and Panthers - 38. High Individual Game (March 19): Anna Aten 184, Judy Mahlstedt - 177 and Pat Chipak - 169. High Individual Game (March 26): Judy Szymanski - 191, Denise Wylie - 171 and Nancy Connors - 167. High Individual Series (March 19): Judi Mahlstedt - 492, Anna Aten - 455 and Carole Hamersly - 455. High Individual Series (March 26): Nancy Connors - 455, Judy Szymanski - 438 and Linda Sproul - 436. High Team Game (March 26): Calicos - 735, Panthers - 690 and Wildcats - 690. High Team Series (March 26): Panthers 1951, Calicos - 1945 and Wildcats - 1914.
old instrument will get a full overhaul, thanks to a donation from The Rotary Club of the Abingtons. 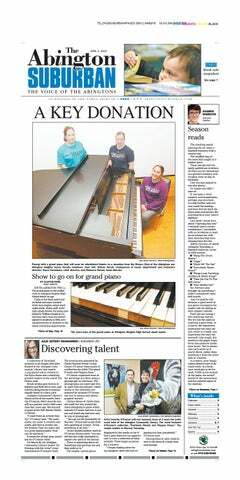 “It will be like a brand new piano,” said choir director Dana Cerminaro. The $3,000 donation the Rotarians made will cover the costs to refit the instrument inside and out. The retrofit process will begin when the school year ends and the piano is expected to return in time for use next school year. Cora Krug, age two, embraces Dorothy O’Connor. Many Artist Dorothy O’Connor greets Chrissy Rimes at the of O’Connor’s paintings were inspired by animals on Abington Community Library’s ‘An Evening with the Artist’ event on March 28. Fuller’s Overlook farm where Cora lives. People mingle at ‘An Evening with the Artist,’ an event featuring the artwork of Waverly Township resident Dorothy O’Connor, at the Abington Community Library. Get the perf rfect f ctt table for your Easter Dinner!